Is it at all possible for a Being,who sees the smallest need of His smallest creature and who meets its need unexpectedly, who hears the most secret voice of His most secret creature and helps it, who answers the prayers uttered by the tongue and by the tongue of disposition, and who is the owner of endless compassion and mercy, not to know the need of His greatest slave and beloved creature, not to fulfill his desire and not hear the loudest prayer and not to answer it? Definitely not! 1st STEP: WHO IS AL-MUJIB,WHO ANSWERS PRAYERS? A person who looks at this realm carefullywill see that the prayers of all of the beings are answered and all of the voices are heard and answered. For instance, the sustenance of the animals and plants are given perfectly and none of them are left hungry. The sustenance of the weak onesand the young ones is sent perfectly. This is answering their prayers uttered by the tongue of need. Who is the One that answers their prayers with compassionand mercy and that feeds them gently? A bird wants wingsand they are given to it. A fly wants eyes with five thousand lenses and they are given to it. An antwants a telephone in order to be able to communicate with its friends and it is given antennae. Man wants eyes, ears, tongue, and endless materials and spiritual organs and feelings; and they are given to him. Man wants endless thingslike all other creatures and he is given all that he wants. All of these desires are prayers uttered by the tongue of need and they are answered. Who is the one behind the curtain that hears those prayers and answers them? They are all prayersuttered by the tongue of abilityand they are answered based onsome wisdom. Who is the onethat hears those prayers and trains them with his mercy? Sometimes a plantis about to fadedue to the lack of water;armies of clouds are sent to it.Sometimesan animalis in great troubledue to endless needs;it is sent special help. Sometimesa person feels likethe whole world is against him;everything seems to squeeze him;he is sent helpfrom an unexpected place. Sometimesall of the causes become invalid;even if all of the people and jinn come together,they cannot do anything;just then, help is sent. Sometimesall of the doctors lose hopebut suddenly a cure is sent. In short:Sometimes all of the causes become invalid; all of the helpers disappear and all hopes are lost; just then, an unexpected help from nowhere is sent. It is the answerto the prayers uttered by the tongue of being in desperate need. Who is the one that hears those prayers and helps the creatures who are in difficulty? Who is the one that knows and hears everyone who is in difficulty? Who helps them with mercy? Sometimesman opens his hands and prays.He says what he wants and asks it fromhis All-Compassionate Lord. He throwsall of the causes away andturns to Him only,bows down before Him andwhat he asksis given to him at once. Is there anyone who can say, “I asked from Him but I was not given anything”? Definitely not.All of the prayers that are utteredare answeredbased on some wisdom. Those prayers that are regarded not to have been answeredare either left to the hereafteror are given to themin a better form than they want. He leaves that prayer to the hereafterand enriches his hereafter. Sometimes a person utters prayers for his own happiness in this world, and it is accepted for the hereafter. We should not say, “His prayer was rejected,” but say, “It was accepted in a more beneficial form.” Since Almighty God is All-Wise, we ask from Him and He responds to us. However, He deals with us according to His wisdom. A sick personshould not cast aspersions on the wisdom of his doctor. If he asks for honey and the expert doctor gives him medicine that is appropriate for his malaria, he cannot say: “The doctor did not listen to me.” Rather, the doctor listened to his sighs and moans; he heard them and responded to them. He provided better than what was asked for. It is understood from the explanations we have made so far that there is a Being behind the curtain; He hears every voice and answers every prayer; He hears even the smallest need from a small creature and answers that prayer. The owner of this realm is al-Mujib;that is, He answers every prayer; He hears every voice and helps the owner of that voice. Is it at all possible that God,who most compassionately fulfils the smallest need of His lowliest creatures in the most unexpected fashion, who heeds the muffled plea for help of His most obscure creature, and who responds to all the petitions He hears, whether vocal or mute – is it at all possible that He should not pay heed to the greatest petition of the foremost among His servants, the most beloved among his creatures, human beings, that He should not hear and grant his most exalted prayer? Is it at all possible thatHe should not know, hear and fulfill what Muhammad (Peace Be upon Him), who is the greatest slave and creature among human beings, wants and accept the highest prayer among the prayers that he utters for endless bliss? A person who listens to his heart andspirit will hear the voice and prayer of “eternity, eternity, eternity”. The prayer of the stomachuttered by the tongue of hunger caused the creation of endless food; and the prayer of the stomach uttered by the tongue of need was answered by making the earth a dinner table; similarly, the heart, spirit, mind and all of the other faculties pray for the eternity and ask for the eternity. Is it at all possible thatGod Almighty, who hears the most secret voice of the fly, which is a small creature, and answers its prayer by giving it wings, should not hear and accept the prayer uttered by human beings by the tongue and by the tongue of disposition for endless bliss and Paradise? Is it at all possible thatHe should hear the buzz of a fly and not hear the roar of the thunder? It is definitely not possible;then, He will answer andanswered their prayers andcreated the hereafter and Paradise,which is as easy as creating a flower for Him,to answer their prayers. Among those who pray for the endless bliss are His friends, who are prophets and saints. Among those prophets and saints,there is such a person that he is the reason why this realm was created and he is the most beloved slave of the Owner of this realm. He is Muhammad (pbuh). Is it at all possible that God Almighty should not accept the prayer of this person, whom He addresses as “my beloved”, for eternity and should not create Paradise due to his prayer? 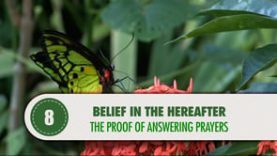 If there were not endlessreasons for the existence of the hereafter, only a single prayer of this person would be enough for the creation of the hereafter and it would be enough to prove the existence of the hereafter. He asks from such a Being for whom to create Paradise is as easy as to create the spring. How can creating Paradisebe difficult for the Absolute Powerful One, who turns the season of spring into a gathering place, who creates hundreds of thousands of creatures out of nothing and who shows us hundreds of thousands of examples of resurrection? 1. The prayers of humans,animals and plants uttered by the tongue and by the tongue of disposition are answered based on some wisdom. 2. That answeringmakes us know the Being behind the curtain with His name al-Mujib (the Responder to Prayer). 3. Since He is al-Mujib andsince He answers every prayer fulfilling even the simplest requests, He will definitely respond to prayers regarding the hereafter. 4. Among those who pray for the hereafterand endless bliss is Muhammad (pbuh), His most beloved slave and creature; this person prays on behalf of all prophets and his ummah; and he makes those prophets say ‘amen’ for his prayer and uses the most beautiful names of God as an intercessor for the acceptance of his prayer. It is definitely not possiblefor this prayer not to be accepted and for the hereafter not to be created.